This cemetery was started by Daniel Herring in the 1870's. He came to Collin County in 1848 from Illinois with his wife and family and his mother and was in the same group as William Sachse. His headright spanned the Collin/Dallas county line. He built his home on the highest point of land on his property. That would be about 1 block north of the cemetery. 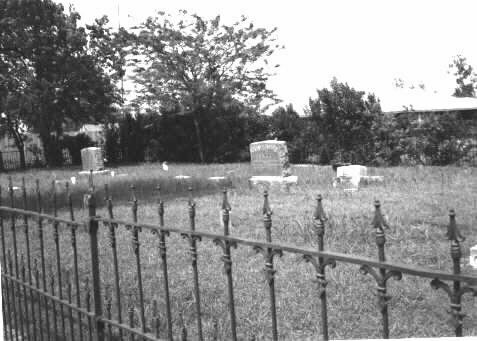 His first wife and his mother were buried in the Old Murphy/Maxwell-Decatur Cemetery, probably in the 1850's. The Herring Cemetery had not been started at the time of their deaths. Daniel Herring and his second wife are in the Herring Cemetery. The earliest graves here are in 1874. One of the Herring girls married a Hogge. The Herrings and Hogges make up most of the cemetery. There is a history of Daniel Herring and his family in the Sachse library in the book SACHSE REMEMBERED. There is a very good write-up on the cemetery in THE WYLIE NEWS, January 18, 1995, entitled "History intertwined in early family histories." The cemetery faces Murphy Road. It has a wrought-iron fence with a walk-through gate and is about 40 x 80 feet in size. The grass has not been mowed recently. Someone has put in new stones in place of some of the old ones. The old stones are lying flat on the ground. This cemetery is for 3 old families of the area, including McAmis, who also married into the Herring family. Some local residents call it the Hogge Cemetery with a long O. I have not been able to find a deed for this cemetery. 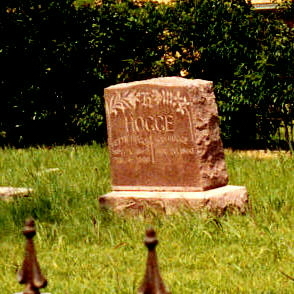 The history of the Hogge name is that is was originally spelled "Hogue." There was an unsavory person in the area of St. Paul, Dump, with the same name. Mr. Hogue was the post master of Dump. He decided that as post master he could, and would, change the spelling to "Hogge." The cemetery is about ½ mile south of the intersection with Renner Road.